It's strange to think that in the same year Sega launched a traditional 2D Sonic the Hedgehog game that finally gave the fans what they wanted, it was the announcement of a Wii game that continued in the same vein as the undesirable "modern" titles that captured the excitement of the fans. 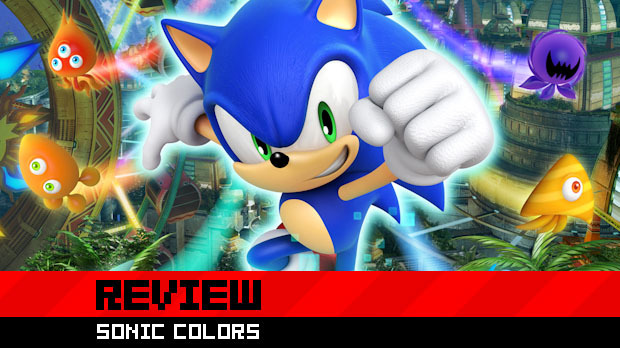 Sonic Colors, despite its status as a "3D" Sonic, complete with a focus on narrative, gimmicks and brand new colorful friends, has somehow convinced everybody that this is the legendary "return to form" that Sonic fans have been waiting for. All I have to ask is ... how has Sonic Team managed to pull the wool over our eyes again? 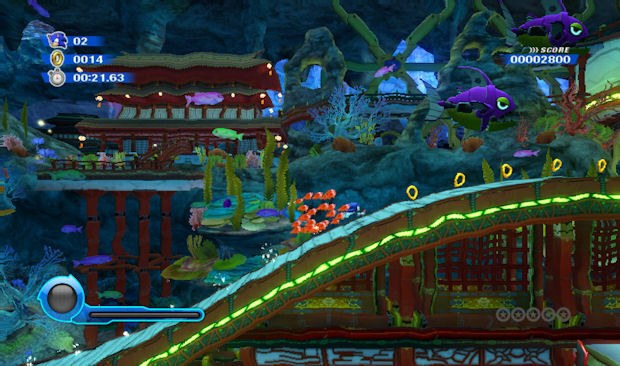 At first, Sonic Colors appears to have finally done everything right. By taking the fun and speedy levels from Sonic Unleashed and leaving behind the dreary "Werehog" nonsense, Colors breezes through its first few stages with an empowering, thrilling charm. It truly does manage to convince one that Sonic has finally nailed it. Then come the laggy controls ... and broken homing attacks ... and pitfall deaths ... and 2D platforming sections so badly presented, you'd think they were patched together by chimpanzees. Then you realize that Sonic Colors is a case of the same old problems, in a brand new package. The simple fact of the matter is this -- Sonic Colors is terribly designed. The level layout is atrocious, putting the focus on cheap pitfall deaths instead of real challenge, and various platforming sections that clash with the game's very physics. There are issues in Sonic Colors that have plagued the series since Sonic Adventure first arrived on the Dreamcast, confirming once and for all that whoever works at Sonic Team, they just don't have a clue what's wrong with their games. This is compounded by the fact that Colors tries to be two games at once, despite the fact that Colors isn't versatile enough for that. The engine simply isn't equipped for both 3D racing and 2D platforming, and the abhorrent way in which Sonic controls during these latter sections demonstrates this fact over and over again. Sonic floats mystically in the air with every jump, making precision landing next to impossible. The jumps possess an otherworldly inertia that one never quite gets used to, making these segments feel laggy and uncomfortable. And this is all before we get to the controls. First of all, don't use a Wii remote. This game requires a Classic Controller to even start being enjoyable. Secondly, whatever controller you use, the layout is absurd. For instance, you'll need to make liberal use of the double jump, but if you double jump when there is a homing attack target nearby, you'll whizz over to the target instead. Sometimes this can land you in trouble, especially during the sections where the camera zooms out to such a degree that all the graphics look like a muddy blur and you don't even know where Sonic is, let alone how to get him across a network of moving platforms. Sometimes, the game seems to require sheer dumb luck in order to progress. 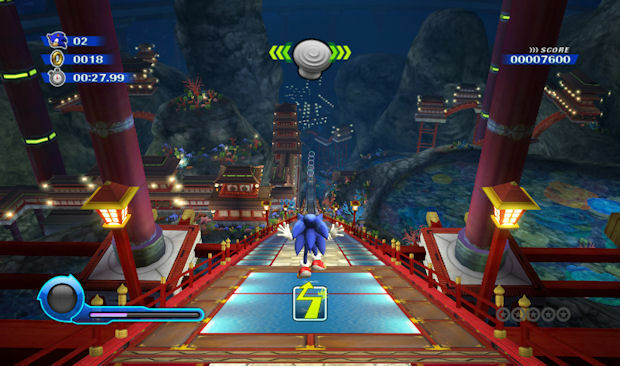 There are also sections where Sonic must quickly zip from left to right while running along a path. These were among my favorite parts of Sonic Unleashed, mostly because Sonic's movements used the left and right triggers, which felt rather satisfying. Not so with Colors, even on a Classic Controller. In Colors, you have to push the movement stick left and right, while still pushing forward to keep Sonic running. I'll let you guess just how great that feels. Fortunately, the game gets some enjoyable moments thanks to the Wisp gimmickry. Usually, Sonic's gimmicks are the worst part of his games, but at least the Wisps of Sonic Colors have some merit to them. 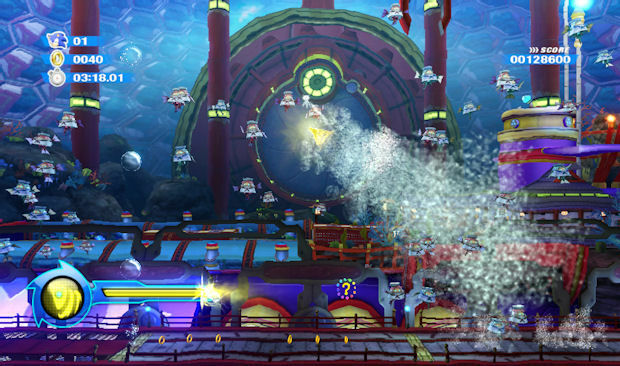 These little aliens are being used by Dr. Eggman to power his intergalactic theme park, and once freed, they bestow upon Sonic a multitude of special abilities. White Wisps allow him to dash, Orange Wisps turn him into a rocket, and Purple Wisps change Sonic into a giant maw of chomping death. These alien abilities are legitimately fun to use, helped by the fact that Sonic's various transformations are quite unique and even adorable at times. The Wisps aren't always mandatory to the completion of a level, but they can open up new paths in order to collect more rings, find shortcuts, or collect red tokens for unlockable stages. Of course, sometimes the speed at which the game moves makes missing Wisp opportunities far too easy, and it seems Sonic Team expects you to replay levels over and over again to learn where everything is. Unfortunately, the fun levels are so few that you'll be angry you played most of the stages once, let alone multiple times. The frustrating part is that, at times, Sonic Colors truly does show flashes of brilliance. Several of the earlier levels are fantastic, finding as they do a perfect mix between speed and challenge. When a level works, it really works, and some of the boss fights are more unique and clever than your usual Sonic fare. The game's story is also fairly tolerable, and Sonic seems to have had a personality makeover, now becoming an affable idiot with a terrible sense of humor. 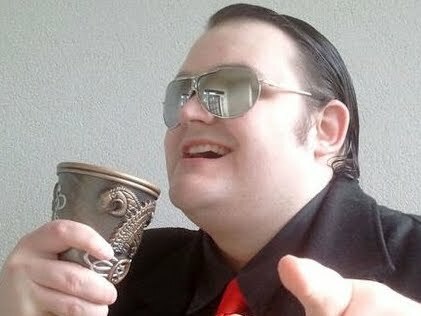 His new voice actor, and this amusing personality shift, make for a much more enjoyable hedgehog than the "cool dude" we've seen in the past. The jokes don't always work, but the writing is vastly improved over previous games. It seems, however, that the further the game goes, the less the developers gave a crap, and every instance of inspiration soon gives way to the same sloppy, slapdash construction we've witnessed a dozen times before. Even when a stage starts brilliantly, the game invariably finds a way to muck it up with some sort of new environmental trap that wasn't introduced properly, or a slice of transparent trial-and-error gameplay that has been designed purely to force a replay. To its credit, Colors attempts to curb the frustration of pitfalls and platforming by flashing a warning sign before a jumping section, but these warnings are so vague and appear so suddenly that they might as well not be there. 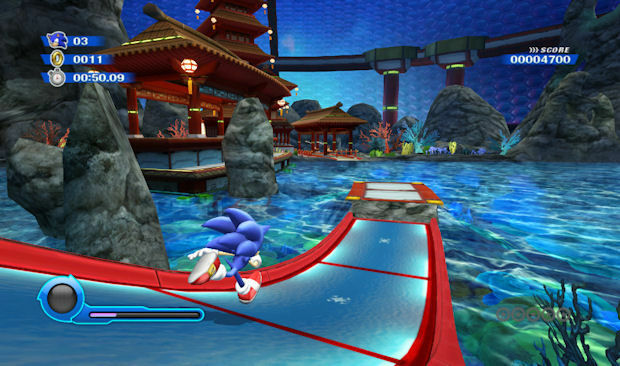 The Wisp idea is pretty cute and remains fun throughout and there are a smattering of well crafted stages, but the rest of the game provides absolutely nothing you didn't already play in Sonic Unleashed or any other 3D Sonic game released in the past ten years. The problems are exactly the same, and shoddy levels are just as bad as always, and death-by-pitfall is in as much abundance as ever. Sonic 4 had its problems, but at least it was an improvement. Sonic Colors feels like a step right back into the same crap this series has drowned in for the past decade. If I had to pick a color for this game, it would be brown, for very obvious reasons.